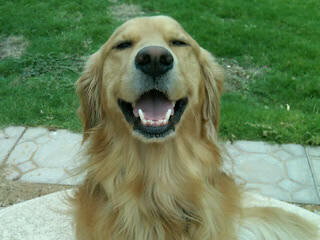 Warning:Sometimes breeders cross American Goldens with English Creme Goldens and pass them off as pure English Creme. If there is any color in coat (check their ears) they are not pure English/ European/ White Golden Retrievers. Be sure to look at the parents because sometimes puppies will darken as they get older. My AKC registered, European Goldens are OFA certified and are intelligent, beautiful and strong! They are pure white with the required black noses, with impeccable pedigrees! Let me know if you believe you could make a good home for one of my white little fur babies!